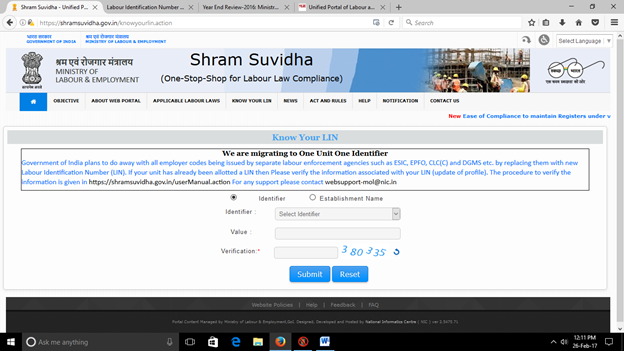 1) Unified portal for all compliances that are made to Chief Labour Commissioner, Director General Mines & Safety and Central Government. 2) Easy control including getting inspection reports from enforcement agencies online, clearing there questions online. 3) Creating 1 identification for the employer among all the various labour laws. 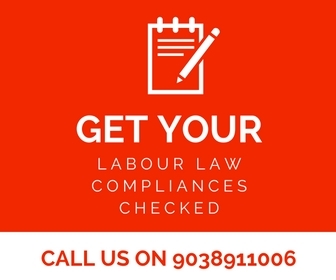 Labour Identification Number or LIN, creates one unique identification number that will supplement all individual license numbers such as EPFO Employer Establishment Code, ESIC Employer Registration Number, Contract Labour User Registration Number etc. 4) Ease of compliances like maintenance of registers, one window to file annual returns under various acts along with a single window for filing EPFO & ESIC returns. a. 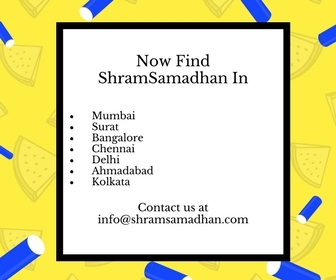 Enter an Identifier, like EPF Registration Number, ESIC Registration Number, Contract Labour License or Registration, GST ARN, CIN of Company and many more. c. It is recommended to go with Identifier option as they are giving quick results. 4. Your LIN will appear in the window that opened. If it does not show up then you need to email it to help-shramsuvidha@gov.in or Call 011-23354722 for assistance. 5. Do the process 1 to 6 from below, and then Click on Link Establishment Button. Fill the LIN number and Registered Mobile + Email. Then Click Submit. 3. Now fill the details of Owner or Occupier like First Name, Last Name, Email Id, Mobile No + Press Submit. 4. Then enter the OTP that came to Mobile Number. 5. A link will be given in email id, to go to your account. Click it. 6. Update “USER PROFILE” by clicking button above. THE ABOVE PROCESS IS COMMON AND HAS TO BE DONE IN BOTH OLD AND NEW ORGNAISATIONS. 7. 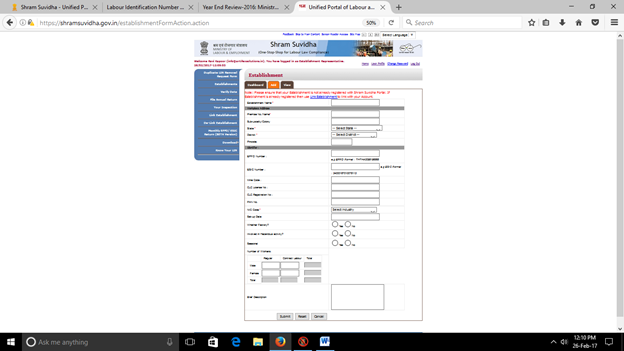 Click Establishment Button + Click New +Fill the form along with EPF or ESIC or Other Registration Number. 8. Now Click on Verify Data Button. Then verify the data by either providing scanned copies of documents or other details as asked. If Verify Data shows no items to display then you do not need to verify data. 6. Press Final Submission when all are filled up. 3. Then the process is same as we are accustomed to in EPF and ESIC. Status of my establishment is showing pending verification and LIN has not been alloted since last three months. What to do now? Different LIN allotted for different project of my establishment under CLC , but when I click on file new annual return under CLC annual return is not responding.